Michael Douglas, like most skilled actors, can deliver good performances in his sleep, but these types of actors are only exciting to watch when they try something different or really put in the work to elevate their performance. 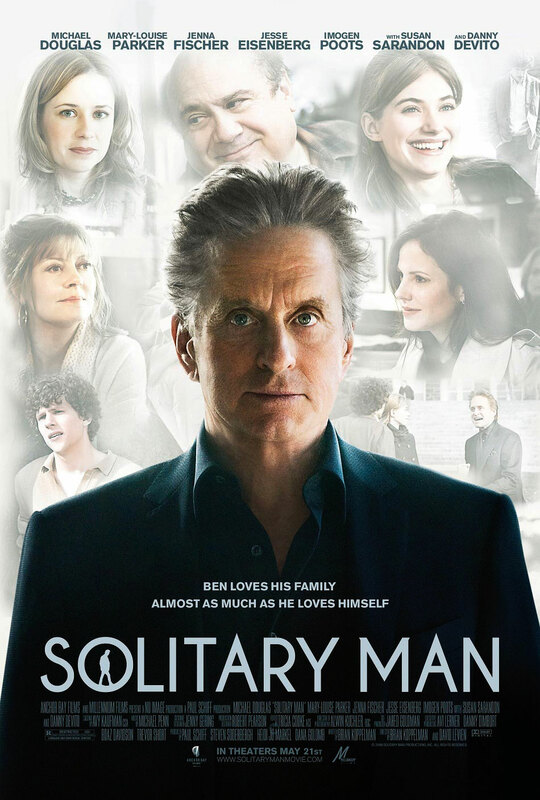 In “Solitary Man,” it seemed to me like Douglas was sleepwalking through the entire movie. It’s really a shame because this could have been a great role for him. Fascinating performances often arise when actors take parts that reflect where they are in life, particularly at milestone ages. From child to teen, from youth to adulthood, from young to middle-aged, and for Douglas, from middle-aged to the age of mortality. The theme of confronting old age is particularly eerie to watch now given Douglas’ fight with cancer. Yet while all the components are there, something just doesn’t add up. I wouldn’t attribute it all to Douglas; the film’s plot is pretty weak and the self-examination severely underdeveloped. This is such a rich topic, but the movie only brushes the surface. Douglas’ Ben Kalmen struggles with a lot of things: his loneliness, his infidelity, his fall from grace in business, his desire to stay young, among others. The psychological struggle is all provided by Douglas, not at all by the script. Nowhere is there a great line for us to chew on or a particularly interesting plot development to leave us reeling. There’s just predictable old plot gimmicks that run for 90 minutes, which hardly feels adequate for Douglas to give the character much depth. Right now, I am 15 minutes into “Solitary Man,” 10 minutes into “Pollock,” 40 minutes into “Control,” 7 minutes into “Down to the Bone,” 2 minutes into “The Girl with the Dragon Tattoo,” and I’m probably forgetting countless others. This fragmented moviewatching style totally doesn’t work for me, yet I’m having to resort to it more and more because of my demanding schedule. Anybody else have this dismembered moviewatching style as well?